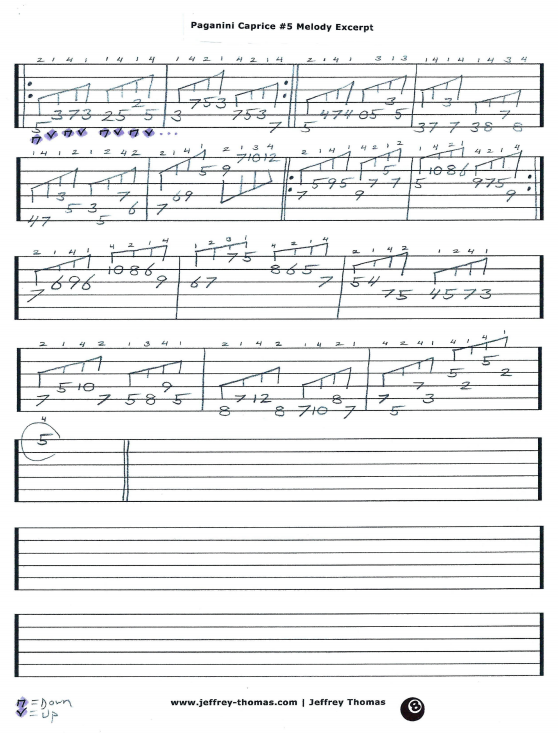 Paganini Caprice #5 Melody Free Guitar Tab by Jeffrey Thomas. This free guitar tab shows the famous lick from Crossroads the movie where Steve Vai lost the guitar battle with Ralph Macchio AKA “The Karate Kid”. I was reading through some Paganini violin studies a few weeks before I watched the movie and as soon as the lick came up I remembered it. In the movie it is played up in 12th position. I decided to write it in a lower register to improve the left hand stretch. This is a great warm up, technique study for the left hand and alternate picking! Want the full guitar tab for free? Send in your email address through the form provided. Want to learn shred guitar technique? Fill out the Schedule A Free Lesson form to set up your free Skype guitar lesson. Check out the famous 24 studies by Paganini who was a virtuoso violin player and inspiration to shredder style guitarists. More free online guitar lessons on my tab, video and blog pages.